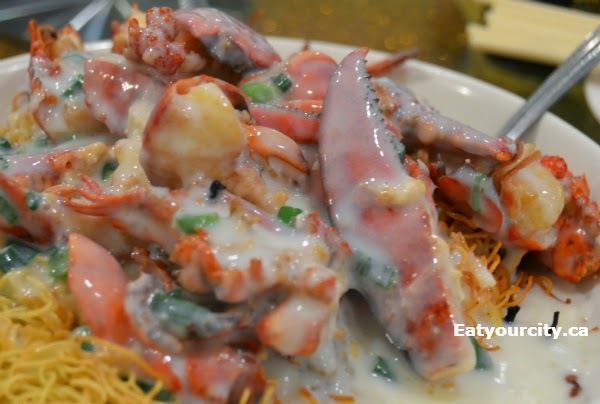 Eat Your City: Lucky Place Restaurant Calgary, AB - tasty quick and easy on wallet Chinese lobster lunch! 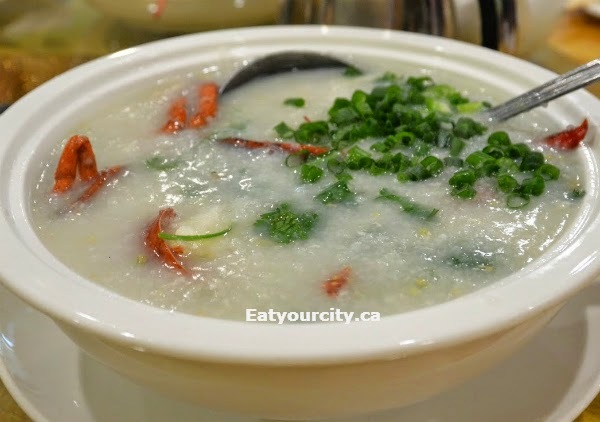 Lucky Place Restaurant Calgary, AB - tasty quick and easy on wallet Chinese lobster lunch! Posted by During a recent jaunt down to Calgary, we met up for lunch with my aunt and cousin for lunch at this little hole in the wall Chinese restaurant. Owned and run by two chefs formerly of Harbour City Restaurant, I would have never have even found this place had it not for my fabulous aunt who keeps tabs on the food scene in Calgary. Every day, there are $9 and $11 lobster, seafood, noodles and rice lunch specials.. and its big generous plates of food to entice folks to try them out and return for dinner at dinner prices. Onto the lobster! Since we were hungry and had a reasonably large group, we ordered some regular stuff off their menu as well as their lunch specials. We started with my fiancée's fav (yup.. he proposed so I can't call him boyfriend anymore!) - the Chinese chive pancake. It was executed well with soft fluffy scrambled egg holding in a good amount of fragrant chopped up fresh chives all enrobed by a crisp and not too greasy pancake-crepe envelope. The Pan fried pork and vegetable dumplings was lunch special and available on regular menu as well. 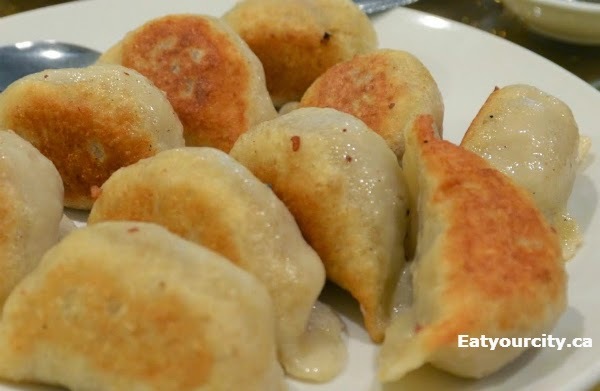 The dumplings had a nice crisp exterior to it, and the filling while savory was a bit on the soft side indicating there was more vegetables than pork, but I guess that makes them healthier! The Special fried sticky rice was out next - was hit and miss depending on who you asked around the table. I found it tasty with individual sticky rice kernels still discernible (I really dislike sticky rice dishes so overcooked they resemble a rice pudding), others wanted bit more meat, some wanted more vegetables... guess its like asking folks to rate a mac 'n cheese! We all really enjoyed the Fried thick noodle Shanghai style. Soft, al dente with a bit of chewiness, the sliced noodle pieces were lovingly imbued with salty savory goodness, garlic, Chinese sausage and green onions... nom! 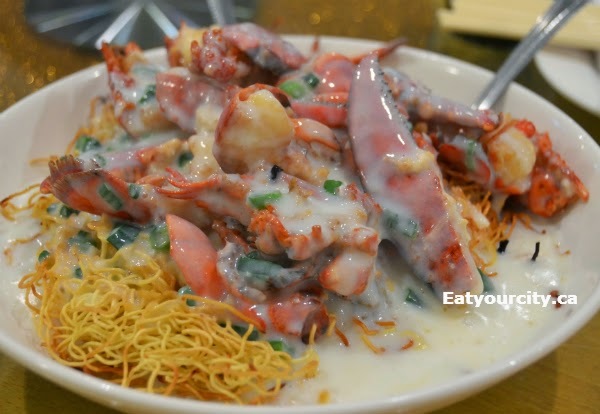 The Lobster in cream sauce with wonton noodles is one of the lunch specials - a whole medium sized lobster is cooked to perfection swimming in a light cream sauce and a bed of crispy fried wonton noodles. It could have used more noodles to sop up the yummy béchamel sauce, but for the price, totally not complaining! The Lobster congee is also a lunch special - a whole medium sized lobster can be found in this tureen of congee (think a thick creamy rice soup). It could be improved by poaching the lobster directly in the congee to impart more fresh lobster flavor to the congee, but it was tasty none the less as the congee had a nice velvety smooth fluffy texture. Lastly, since it was getting chilly outside, we had the Beef brisket with rice noodle rolls to round things out. 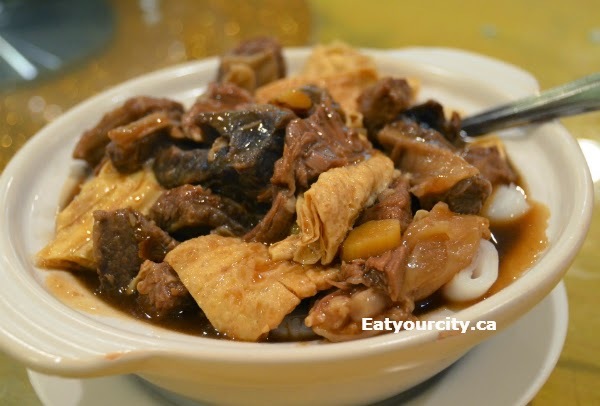 A hotpot almost overflowing with tender bites of slow cooked beef brisket scented with cinnamon and star anise are swimming in this rich caramel brown stew that is readily soaked up by soft pieces of bean curd and thick pieces of rice noodle rolls. The noodle rolls were quite on the thick side and threw off the carb-meat ratio, but it was a nice complement to the beef brisket stew.